Ronny Collins, a partner in Duckett, Bouligny & Collins, L.L.P., is the leader of the firm’s litigation section. 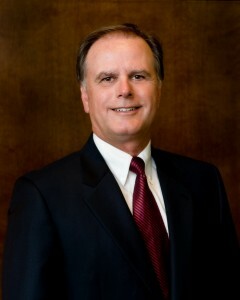 Ronny has obtained favorable verdicts, judgments and settlements on behalf of both plaintiffs and defendants in a wide variety of cases, including oil and gas, royalty disputes, condemnation, family law, personal injury, probate litigation, real estate, employment matters, construction contracts and consumer claims. Ronny has also served as City Attorney for the City of El Campo since 1991. Ronny grew up in El Campo. He began practicing law with Duckett, Bouligny and Collins, L.L.P. in 1983 as an associate where he was fortunate to develop his legal skills under the guidance of L.L. Duckett, Jim Bouligny and his father, Richard B. Collins. Ronny is a member of the Wharton County Bar Association (Past President), College of the State Bar of Texas, American Board of Trial Advocates, Life Member of the Baylor Alumni Association, Baylor Bear Foundation Member, Trustee of the First Baptist Church of El Campo, Member of the El Campo Rotary Club (Past President) and has served on the Board of Directors of the El Campo Chamber of Commerce (Past President), and is a former board member and President of the Board of Trustees of the El Campo Independent School District. Ronny is married to Bonnie and they have three grown daughters, all of whom were honor graduates from El Campo High School. Ronny has spent countless hours supporting and mentoring the youth of El Campo and volunteering for civic organizations. He continues to serve the community in numerous ways, supporting education, athletics and academics. In his free time, Ronny and Bonnie enjoy spending time with their family.